Description: Mario, Luiggi and the whole gang have come to visit you and have a great time with you. Are you ready to rescue the princess?? 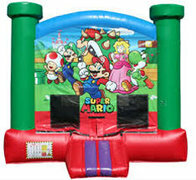 Your child and their guests will have a great time with this Super Mario Bounce House everyone loves this classic character!